"Reporting Data Sets" is where you go to select the information you want to include in reporting or to export out of the system. To access the reporting data set tools, from within GLM, click on the Reporting Data Sets tab from the Reports & Data Sets page. All sites will have five default reporting data sets listed in the Reporting Data Sets tab. These sets cannot be edited or deleted, but they can be copied and used as building blocks for other data sets. If you do not want to use the predefined data sets, or if you want to build a data set from scratch, click the "Add New Data Set" button in the upper right hand corner. This will take you to the screen on which you can create a new data set. 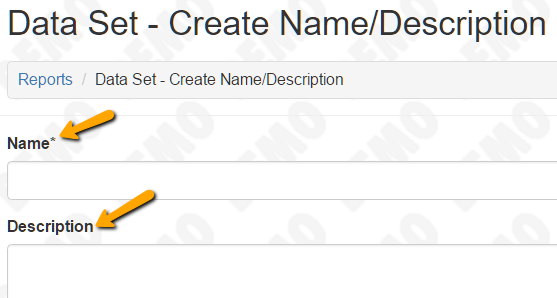 When you add a new data set, you will be prompted to add a Name and an optional Description. Be sure to name it something you’ll recognize in the future! Once the name and description have been added, click "Create Data Set" in the upper right hand corner. Next, you will be prompted to select the Processes, Request Statuses, and Form Types you would like to include in this data set. By default, the Request Statuses and Form Types sections are collapsed. Click on the bar to open that section which will allow you to select those additional pre-filters. Clicking “Save Filters” will bring you to the next step. The next stage is where you select specific data fields to report on. 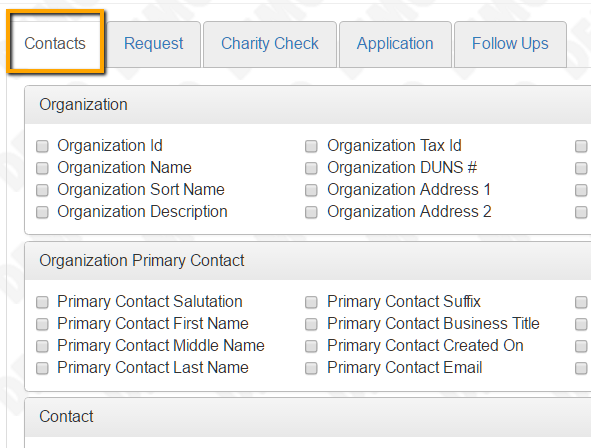 For client with "grants" databases, this information will include organization and contact information. For clients with "scholarships" databases, there will not be organization information. These tabs include the forms the applicant/grantee filled out as well as the evaluations tied to the relevant stages (follow ups do not contain evaluations). Within each tab, each process that includes the form will be in its own accordion box. When you expand each process's accordion box, you will see all of the selected form's questions for that process. You can add questions from any of the tabs, which means you can report and export data from multiple forms within the processes you selected to build this data set. This capability will be very important for building outcomes report; you will be able to take information from the application and put it next to information on a follow up. To select a question to include in your data set, just check the box next to the question's label. Right after you check the box, that question will show up in the list of selected fields on the right side of the screen. 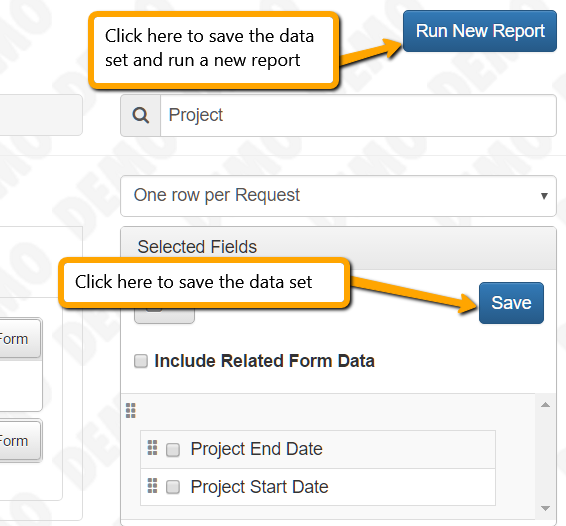 Once you have defined your data set with the desired fields and organization options, you can either click the "Save" or "Run New Report" buttons. Note that if you click "Run New Report" it will automatically save the data set. Clicking "Run Report" will take you into the reporting tool (Logi). Clicking "Save" will save your data set. You can then access the data set from the Reporting Data Sets tab on the Reports Home page. If you edit a data set any saved reports built off of that data set will be updated. You would copy a data set if you want to re-use most of its definition (the select questions, etc. ), but you do not want to change any reports tied to it.